The family that plays sports together also needs to relax and recover from a grueling game together! This cozy personalized fleece blanket will be just the thing to help any sports loving family rest and relax before their next big game. This Personalized Gray Blanket is a 50/50 cotton/polyester, 9.3 ounce fleece blanket. Double-needle stitching and Standard Ultra Blend® label. 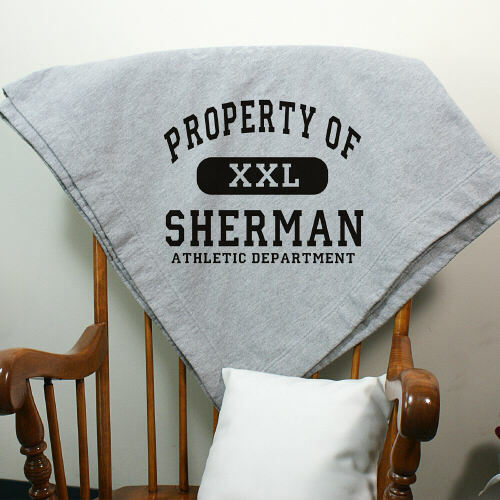 Stadium Blanket measures 50” x 60” and includes free personalization of any name and up to 10 different colors for the text. Additional Details This is one personalized gift that any sports loving family member or friend would love. They'd love to relax underneath the cozy, warm fleece blanket and get ready for their next sports match. Our Football Fan Personalized Sports T-Shirt would be great for the football fanatic in your life.